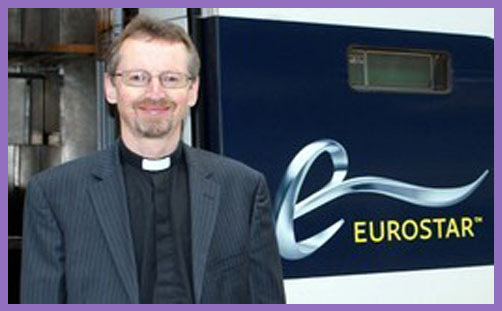 “Let me be clear,” said the Rt Rev’d Dr Robert Innes, Bishop of* Europe, as he addressed the General Synod of the Church of England. “From my European perspective, this Referendum and its result represent a sad loss of national vocation; an abject failure of political leadership; and a squandering of the birthright of our young people.” And Synod applauded their Euro-prophet for a full 10 seconds, seemingly oblivious to the fact that lay Anglicans voted for Brexit in their droves (and by a majority). “Britain seems to be a country anxious to build fences,” he added, before reminding the people of God that his task as a bishop is to build bridges. Not to the wider world, it seems. Or even to the 22 nations of Europe which aren’t in the European Union, which includes the supremest bridge Pontifex himself, all neatly fenced off in Vatican City State. But Dr Innes’ task as a bishop is to build bridges to the other nations of the European Union, and without political union he is seemingly bereft and hindered from doing so. To leave the European Union is not to leave Europe: Europe is not the European Union. It doesn’t seem to matter how many times you say this, there is a reluctance among the religious and political elites to accept it. They can’t quite grasp that Europe is geographic, historic, cultural and emotional: it is fraternal participation and sovereign cooperation. The European Union is political: it is anti-democratic coercion and supranational imposition. One does not need to belong to a political union in order to cooperate. If one did, then Pontifex would have lost his vocation. The Bishop of Europe acknowledges that some in his Diocese were pleased with the Referendum result, but he doesn’t tell their stories. They are sidelined, disdained and ignored: they don’t quite fit the Bishop’s narrative of shame, anger and deep sadness. “One older man in Paris said to me: ‘I have never been so ashamed of my country.’ A lady in Geneva said to me: ‘I have found it hard to stop being angry. '” There’s no apprehension of joy, liberty, hope or optimism: no awareness of the abundance of bridges we can now build into the whole world. For the Bishop of Europe, British identity and national vocation were wrapped up in ever closer political union: there is no refuge or strength to be found in Brexit. Wisdom, intelligence and understanding are dependent on graduation? A degree in golf course management represents a greater understanding of political philosophy and ecumenical theology? Is that why Jesus appointed a fisherman to lead the Church? Is there not an echo in our historic national vocation of looking out to the seas and saving Europe from herself? Rather than being an abject failure of political leadership, might Brexit not represent a noble and commendable success? Instead of squandering the birthright of our young people, might we not just have preserved their ancient rights and liberties as freeborn Britons? Bishops may conveniently ignore the fact that a majority of Anglicans voted to leave the EU, but they do so at the risk of exacerbating the political gulf which already exists between the episcopate and laity. If the remnants of catholic polity become a hindrance to the expression of necessary reform, history teaches us that they are very easily cast aside. Or maybe not so easily, but certainly categorically: these days reverence for ecclesial authority has to be fostered, not enforced. What on earth is the point of preaching the virtues of immigration and integration if bishops can’t even accommodate the political differences within their indigenous congregations? Can’t Leavers be as holy as Remainers? *His official title is ‘Bishop of Gibraltar in Europe’ (or simply ‘Bishop in Europe’ [there is also a Suffragan Bishop in Europe]). The use of the preposition ‘of’ in this blog post elicited some debate in the comment thread and a number of (eagerly awaited) ‘pedantic’ corrections. It was not an error. When the Church of England decided in 1980 to add ‘in Europe’ to the name of this diocese, they effectively set our island nation apart from the Continent, and so detached Euro-ecumenism from the political belief of the majority of bishops, which is pathologically pro-EU. To have a bishop and a diocese ‘in Europe’ implies that the others are not. Is England not in Europe? Which diocese in England is not considered also to be in Europe? Which bishops are deemed to be in Europe but not of it? Mrs Proudie: "the current zeitgeist favours petticoat government"